A-B-C, it's easy as 1-2-3. Toasted Coffee + Kitchen is a prime spot for artisan toast in Dallas. Their menu, created by Carina Vasquez (Head Baker) and Miguel Cosme (Head Toastmaster) features house-made breads topped with just about anything you could imagine. They have simple offerings like the Coma-Toast which is a sweet Japanese milk bread topped with butter and cinnamon, or more extravagant items like Smokey The Salmon, a country bread topped with smoked salmon, peach-mango habanero cream cheese, cucumbers, and sprouts. For these recipes, I reached out and asked owner Bob Sinnott for their most popular savory toast and best-selling sweet toast. The top savory is an avocado toast called Don’t Get Salty. It’s topped with a house-made avocado spread, which you can easily master in your kitchen with one bowl and a fork and a pinch of salt and pepper. Bee Yourself, a honey wheat bread topped with butter, almond butter, raspberry jam, and a sprinkle of sea salt is head of the sweet list. Toasted makes all of their breads daily. For time and ease, we will be using store bought bread in the Dish Pirate recipes. Both of these are great brunch ideas for entertaining a group or for a fast and simple prescriptions to treat yourself on a stressful morning. 1. Halve avocado and remove pit. 2. Using a spoon, scoop out the interior and place in large bowl. 3. Season with a pinch of salt and pepper. 4. Using a fork or whisk, mash and mix the avocados into a creamy spread. 5. Halve lime and juice into bowl. Start with only half the juice and add more to your preferred taste. 6. Mix again until spread is evenly blended. 7. Toast bread in toaster. 8. 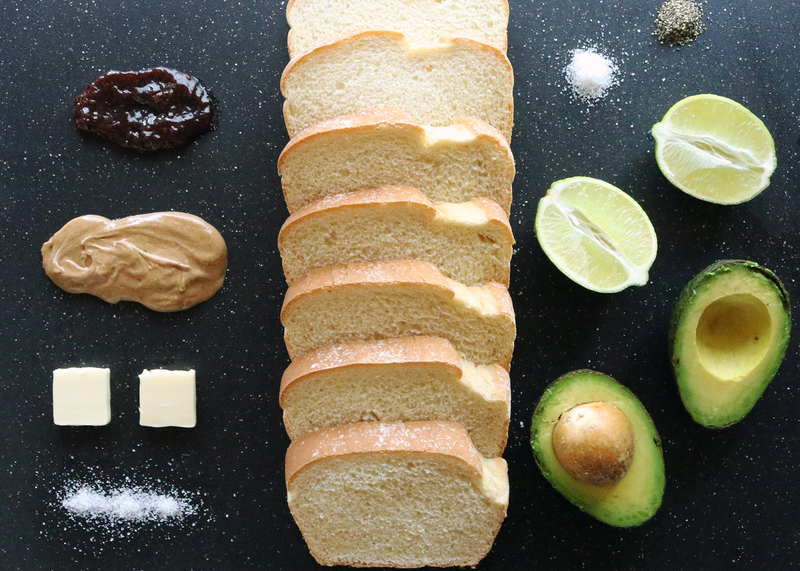 Spread avocado mixture onto warm toast. Make sure to spread from edge to edge. 2. Spread softened butter on warm bread, edge to edge. 3. Spread almond butter on top of butter, edge to edge. 4. Top with a healthy dollop of raspberry jam. 5. Sprinkle with sea salt. This recipe calls for honey wheat bread but I used country bread for the sake of only buying one loaf. It was delicious but I would imagine the honey wheat gives it an even sweeter flavor. Enjoy.